Jerry Jones reiterated Sunday night that Jason Garrett is on solid ground and will return as head coach of the Dallas Cowboys despite â or heck, maybe because of — the franchise’s third consecutive 8-8 finish. But Garrett’s coordinators? Sources tell FOX Sports Southwest that their footing is slippery… and that maybe the head coach wants to help determine if it should remain so. "I stand by what I said a month ago," said Jones following Dallas’ 24-22 loss to the Eagles, marking a third straight loss under Garrett in the âNFC East Title Game.â "We’ve put a lot of effort in training as a franchise into Jason Garrett, and I want to take advantage of that. If we don’t have him, we don’t get payback for all the miscues and losses and criticism of sideline management. We don’t get a chance to benefit from the one way you learn, and that is the mistakes you make. So I want to have him around to learn. I’ve seen another smart coach, a very smart coach, learn from a lot of mistakes early and go on and win Super Bowls. Most of them do." That’s a reference to Jimmy Johnson, might as well be one to Tom Landry, and is quite an endorsement of Garrett and his 29-27 record. A Garrett supporter could argue that those eight wins per year are in part the result of the position things he does; however, Jones is clearly aware of the negatives as he mentions "sideline management." Garrett, meanwhile, may be prepared to present to Jerry and son Stephen Jones an idea that gives the head coach even more authority — although its authority that is commonplace in most NFL cities outside Dallas. 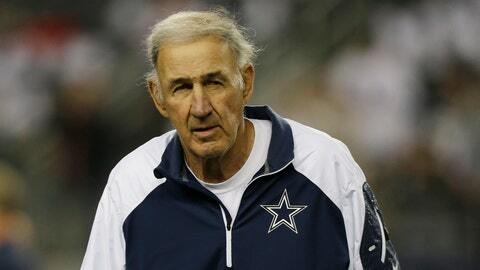 Defensive coordinator Monte Kiffin tells FOX Sports Southwest: "’I got a lot left in me, even though we had some rough ones. Yeah. I’m a coach. I want to be back." Those "rough ones" were games in which opponents piled up yardage in record amounts. Dallas had injury problems on defense (and maybe talent problems, too). But Rob Ryan was relieved of his duties last season for a similar showing and sources say Kiffin is being considered for the same fate. And Garrett — who certainly likes Kiffin personally — might like to join the Joneses in that decision-making process. Cowboys ownership is considering "retiring" the 73-year-old Kiffin. Meanwhile, on offense: A year ago the Joneses forced on Garrett the idea of offensive coordinator Bill Callahan being elevated to play-caller. Simply put, that relationship has not worked out, and there are indications that by the end of the season, Garrett was in charge of play-calling. It is not difficult to envision Garrett requesting a meeting with the Joneses in which he suggests that in the upcoming final year of his contract, he be granted a stronger voice in the identity of his lieutenants. If the Browns clean house, that makes offensive coordinator Norv Turner available. Sources say last year, when the Cowboys eventually settled on the Callahan in-house promotion, the only outside name considered was ex-Cowboys staffer Turner â who declined the invitation to entertain the idea because A) Turner didn’t want the job if he wasn’t going to call plays, and B) was concerned that him calling plays would create the appearance of him undercutting the authority of former pupil Garrett. In Garrett’s final contractual year? Maybe "appearance" doesn’t matter anymore. There will be no change at the top of the Cowboys’ organization chart, where Jerry Jones is in control. But there is an argument to be made for those under Jones (like Garrett) to have the authority to fully manage their own departments. "You keep banging away," Garrett said of being 8-8 yet again. "You just keep banging away. There are a lot of great stories in all walks of life of people who were close, who were close, who were close, and they just keep fighting and keep battling. You just got to be persistent. You’ve got to keep believing and somehow, some way we’ll break through." The next "bang" you hear might be Garrett knocking on Jerry Jones’ door.